In primary school there was a girl that I was friends with called Donna. She seemed to know everything because she had an older sister who told her the gruesome and appalling sounding facts of life and she would pass whispered tidbits onto us in the playground or during class. One day she told a few of us that she knew a word that had a "naughty meaning" but she wouldn't tell us what the word meant. We looked it up in the dictionary and it didn't yield any clues, it simply read "a girl". So we put our hand up and asked the teacher. "Mr Hennessey? What's a virgin?" we asked. Mr Hennessey, a large freckled man with a combover who could go alarmingly red to match his blood pressure turned to us and looked aghast. He spluttered out angrily "What sort of question is that????" We knew we had asked something wrong but we didn't know what of course. And his reaction confirmed what Donna had said, it was indeed a very naughty word. "You've all got detention!" he roared pointing his stick of white chalk for emphasis. We looked at each other scared because of course Mr Hennessy would tell our parents that we had gotten detention for asking about a naughty word and worse still, we still had no idea what the word meant! And now the whole class were alerted to this word but they had no idea what it meant too. A few minutes later Mr Hennessey came up to our desks, calmer and less red. He asked us where we heard of that word and we looked at Donna. "But Mr Hennessey, I thought we were allowed to ask the meaning of words. I also don't know what ...souffle means" I offered mangling the pronunciation. A few days before I heard of it on a television show but had no idea what that meant. He us have sensed our genuine confusion so he lifted our detention and gave it to poor Donna "for being a troublemaker". And it would take me a while before I found out what a virgin or a souffle meant. Donna was keeping her lips shut for once. I can't say I'm an enormous fan of sweet souffles, they're a little too eggy for me but savoury ones with cheese are a different matter. They are all sorts of delicious. 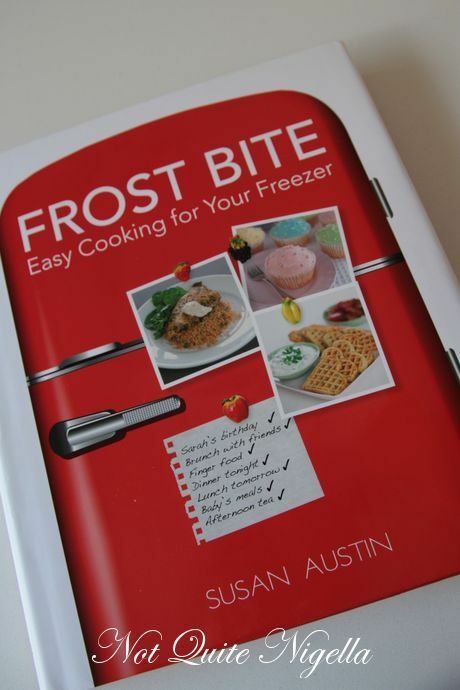 I received a copy of Frost Bite from author Susan Austin and it features freezer friendly recipes for the family and starts with baby food, brunch, lunch, lunch boxes and soups and goes on to finger food, entertaining, week day meal and kid's parties. There are also tips on how to freeze items as well a freezer storage time chart although I would have loved to have seen a freezing guide for individual dishes as it's sometimes hard to place a dish in a category that shows meat, fish or bread, the souffle being a good example. What I learned is that almost anything can be frozen. We all know that stews and soups freeze well but this book tells us that you can pretty much freeze most things. However in some cases you need to freeze things like sauces or meats separately to the grains or pasta and put things together when you want to serve them. I was most intrigued by one recipe and that was a twice baked souffle. The souffle's reputation is that of a diva and even though they are quite easy to make people always think that you've spun some magic when you produce a souffle (and a twice baked one sounds like you've gone to even _more _trouble! ;) ). 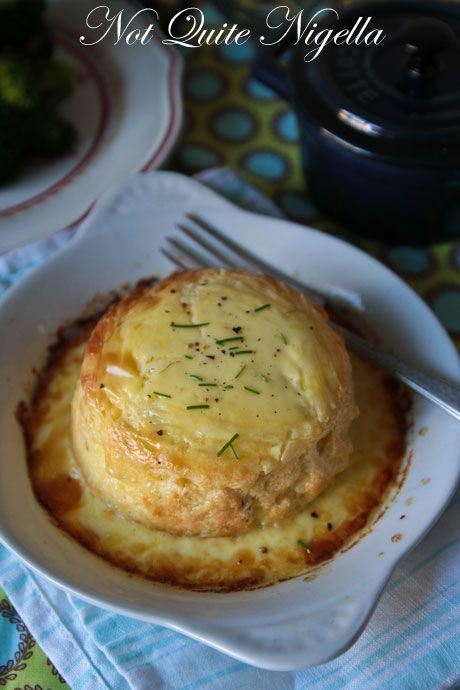 Savoury souffles are a slightly different beast to sweet souffles which I would think would not freeze very well. For starters they start to deflate much quicker and are much lighter and airier than a cheese souffle which has more body. This one was easy enough and I was curious to see whether I would get a restaurant quality souffle from the freezer. 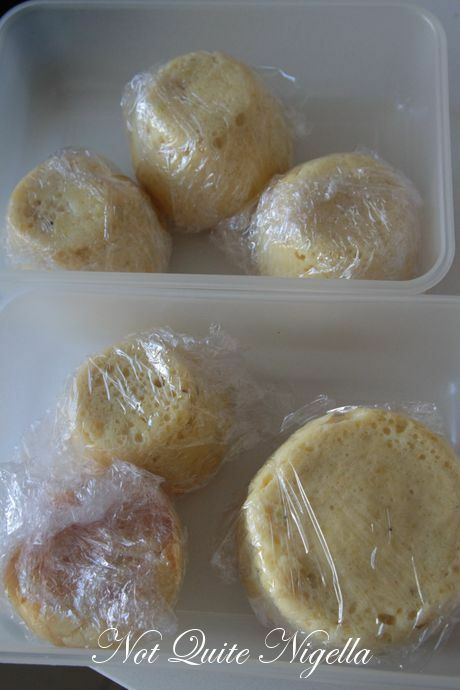 I made the souffles and froze them after wrapping them in cling wrap and placing them in a labelled plastic container. 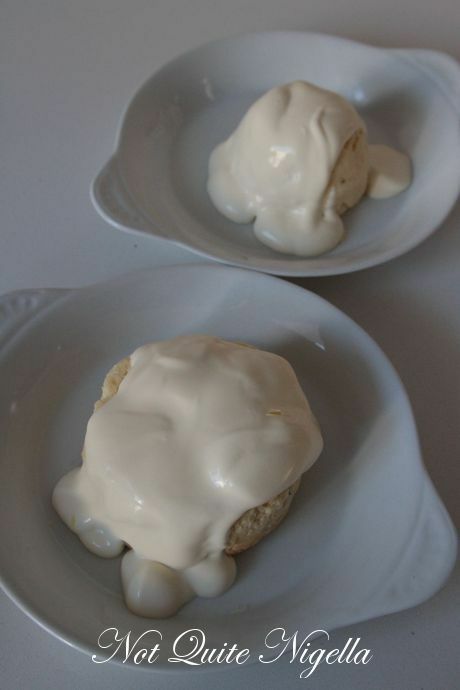 A few weeks later I defrosted them in the fridge and recooked them with cream when I was in a hurry and I wanted to cook something nice for dinner. So how was it? The souffle came out beautifully-fluffy and light and cheesey. It had flavour some the goat's cheese and with a creamy, sauce it was rich and satisfying. And importantly had no hint that it had come from the depths of the freezer. 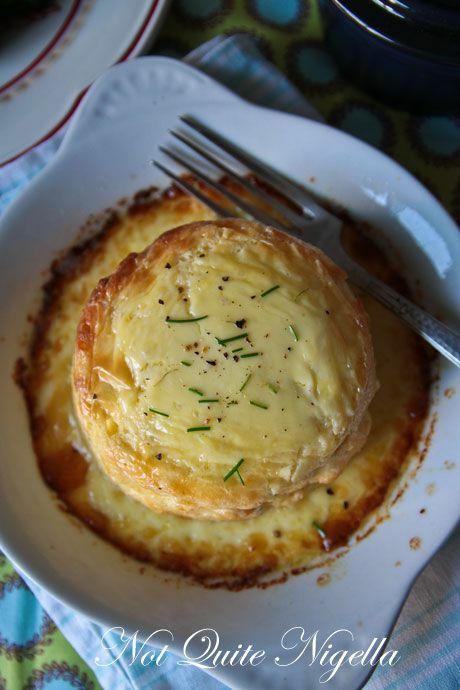 Save this recipe for a time when you know you'll be entertaining as it is a decadent but delicious item to serve guests. And like the domestic goddess you are, just bake with some cream and serve to much applause. So tell me Dear Reader, were you one of those innocent or knowing children? And do you make much use of your freezer? 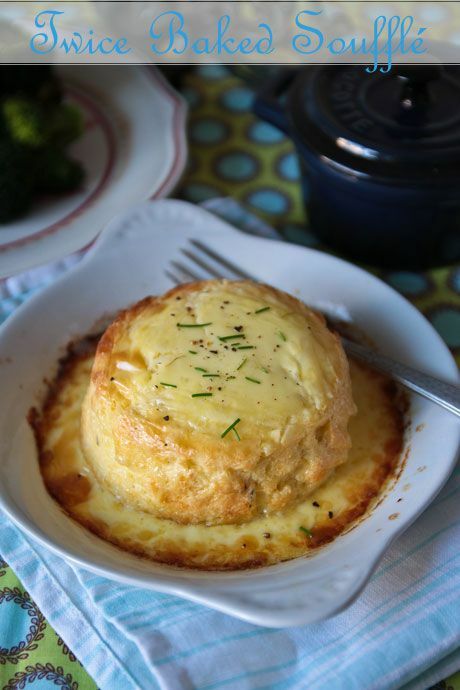 Notes from cookbook: Restaurant quality twice baked souffles are easy. The defrosting is ultra important here-don't defrost in the microwave, just allow plenty of time in the fridge and you'll never know they had been frozen. Step 1 - Preheat oven to 180C/350F. Grease six small ramekins (about200ml/7fl oz each) or four larger ones. Put the kettle on to boil. 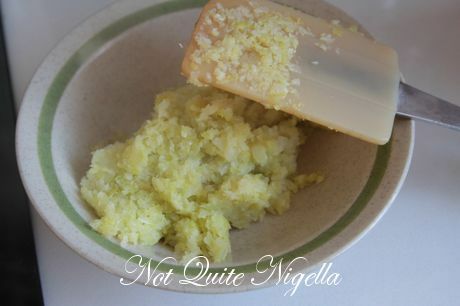 Step 2 - Melt 30g/1oz of the butter in a medium saucepan and add leek. 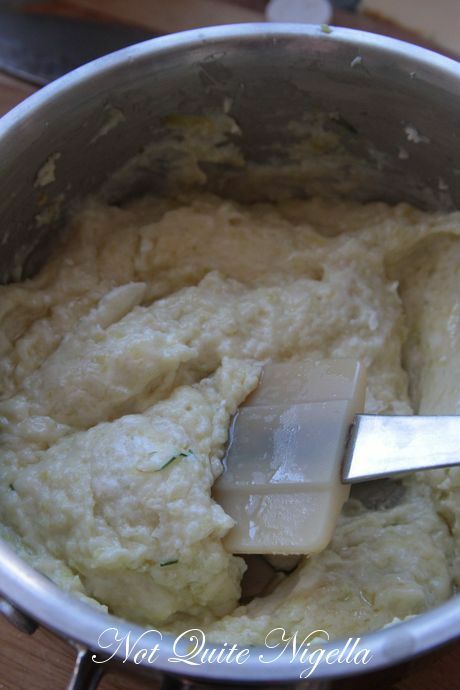 Cook for several minutes or until softened. Remove from the pan and set aside for the time being. 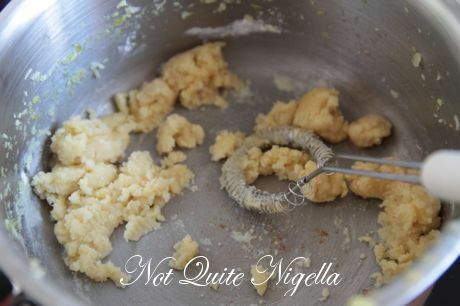 Melt the remaining butter in the saucepan and add flour. Mix well and cook over low-medium heat for a couple of minutes. 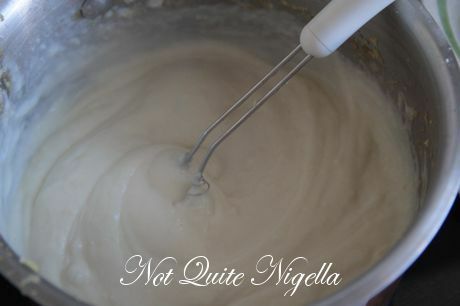 Add milk slowly, whisking at the same time to remove any lumps. When all the milk has been incorporated allow to bubble gently for 2-3 minutes, stirring constantly. It will be very thick. 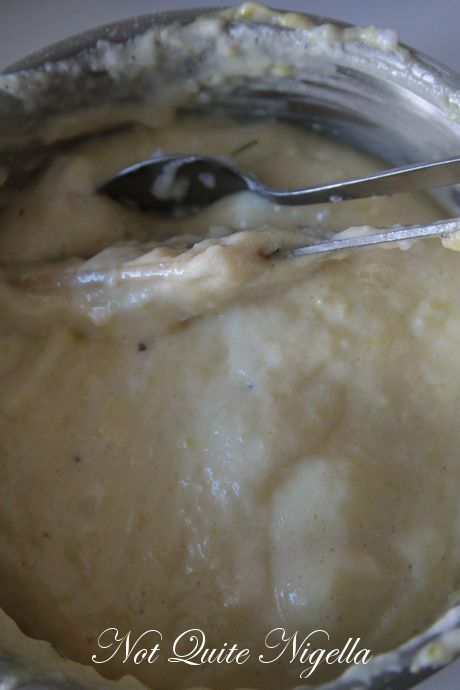 Remove the saucepan from heat and add the cooked leeks, cheese and chives to the mixture. Stir well to combine then allow to cool slightly (about 5 minutes). Add the egg yolks, salt and pepper to the mixture and combine well. 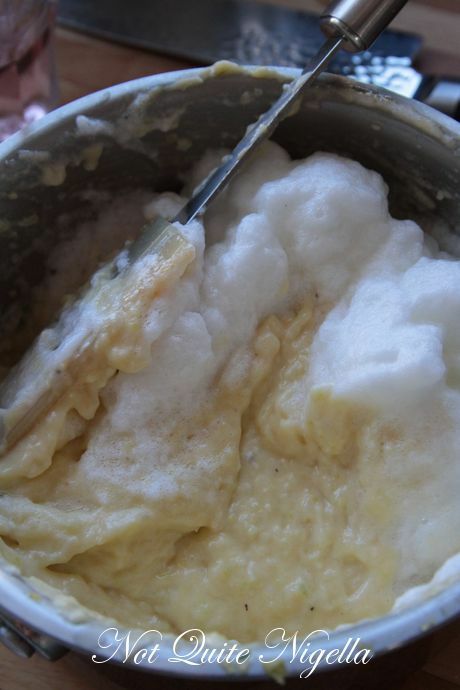 Step 3 - Beat the egg whites until stiff then fold a spoonful of the whites into the cheese mixture to lighten it. Add remaining whites and stir gently to combine. Spoon the mixture into prepared ramekins and smooth the tops. 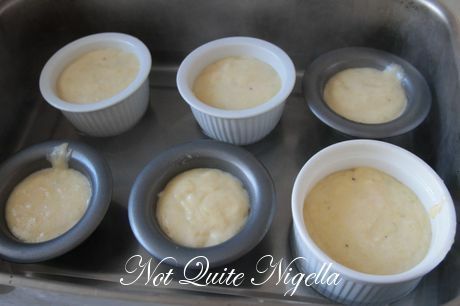 Place in a baking dish then pour boiling water around the ramekins so that it comes half way up their sides. Step 4 - Bake in oven for about 25 minutes or until puffed up and well set. 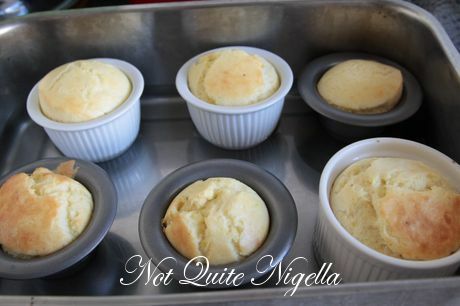 Remove from oven and leave in ramekins for a couple of minutes before turning out the souffles into a plate or tray (they will deflate a little as they cool). 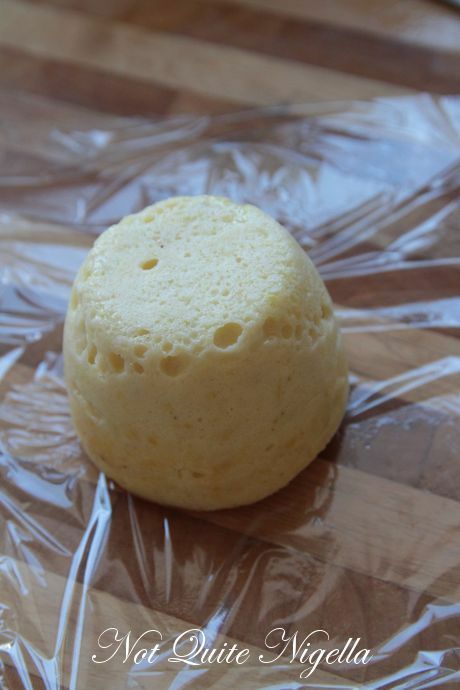 To freeze: Cover the cooled souffles with cling wrap or store in a plastic container and place in the freezer (I did both, I wrapped them in cling wrap and then put them in a container in the freezer). To defrost: In the fridge (or you can partially defrost on the kitchen bench before finishing defrosting in the fridge). Remove a few hours before baking (I put them in the fridge the night before). 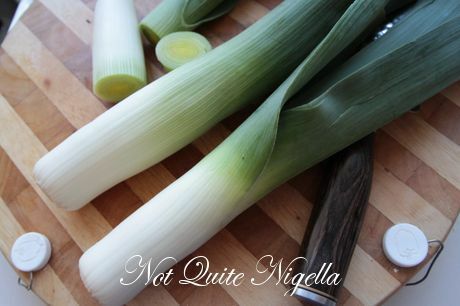 Not suitable for microwave. Step 5 - To cook again, preheat oven to 180C/350F. 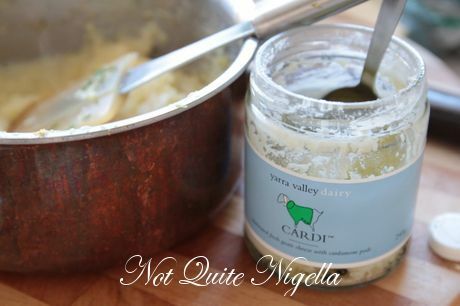 Place a single souffle in a gratin dish and then pour cream over the top of each one. Bake for about 25 minutes or until hot and puffed up. Serve immediately with a green salad or steamed vegetables (I served mine with almond broccoli).